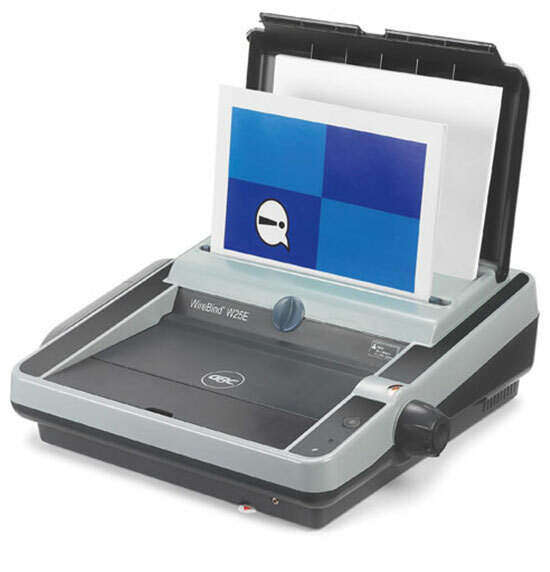 With electronic punching built in, the WireBind W25E Wire Binder makes binding even easier. It has a host of intelligent features including document separating, auto centring, wire closure control and even a foot pedal option. The WireBind W25E punches up to 25 80gsm sheets at once and binds up to 125 A3 landscape, A4 or A5 sheets using a 14mm wire. Simply Click Wire Selector – Adjusts its settings to suit the wire size. Ensures accurate wire closure every time. Perfect Pages – The Auto edge feature ensures there are no ugly paper break outs at either edge. Automatic Centering of Pages – The ‘auto centering’ feature positions the pages for perfect punching.